I previously mentioned that my latest long mix "Ultimate Dance - Winter 07" was first featured on Scott Johnson's Ramdom Thoughts Podcast........well now you can download it in its entirety. 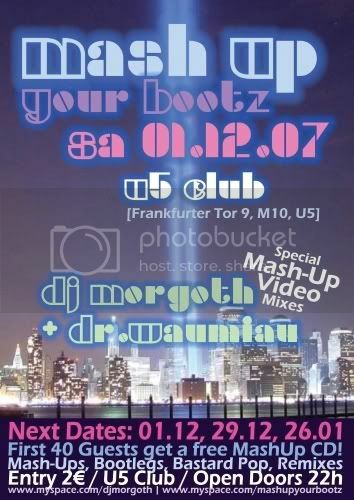 Mash-Up Your Bootz - Berlin !! My good mate Morgoth contacted me to tell me about a fantastic bootleg filled night coming up this Saturday in Berlin. 40 free CD's for the first guest! Looks like a great night ahead - I just wish I was going !!! I have produced a brand new CD length mix entitled "Ultimate Dance - Winter 07". It features some of the years biggest hits by artists such as Marilyn Manson, Leann Rimes, Britney Spears, Cass Fox and Booty Luv all remixed and segued together for almost 80 mins of club magic ! You can hear this mix exclusively first on Scott Johnson's Ramdom Thoughts Podcast - Show 82 before it's official release next weekend. Take a trip over to Scott's site and tell him Bobby sent ya ! Canada's Toronto newspaper, 'The Star', features columnist's John Sakamoto's Anti-Hit List every week. It features his own top ten of alternative, sublime tracks some of which are album tracks, unsigned bands, mashups and remixes. On November 17th John featured my own 'Mercy For The Scientist' from my 'Mercy Street EP' at number 8 in the chart. I have been featured a few times on the top ten before but not for a while so it was great to be mentioned again. John described my mashup like this........"On which U.K. mash-up artist Bobby Martini works his recombinant magic on Gabriel's poignant "Mercy Street" by pairing it with Coldplay's simpatico "The Scientist" and the less obviously compatible "I just want real love" chorus from the early Pink single, "Most Girls." The alternately ethereal and full-bodied result does an admirable job of realizing Gabriel's "dreams all made solid" lyrics"
Thanks to Mr Sakamoto for the inclusion and I hope to be featured again soon. Well here is a clash of the Divas if I ever saw/heard one ! Sugababes "Hole In The Head" fused with Britney's comeback single "Gimme More"
It's pure pop but it works. This EP featuring 4 all new Peter Gabriel Mashups has been a long time in the making and a lot of hard work to get it just how I wanted it. It's my first EP but I am over the moon with it and I hope you will be too.